Whether you're a college or NFL fan, here's what to wear this season. Football season is in full swing, there's no doubt about that! All around the country fans of both college and NFL teams are donning their colors, baking nachos and throwing back a few beers as they cheer. In recent years the spotlight has focused on female football fans, highlighting a lack of cool, stylish apparel that represented their demographic. Slowly but surely, that's starting to change, and the NFL as well as brand partners are designing more football fan gear for women. No matter where you love to watch the games — tailgating at the stadium, on your friend's couch or at a bar, perhaps — putting together a spirited outfit for the day is half the fun. To inspire your next game day look, we put together four cute outfit ideas for NFL and collegiate football fans to wear this fall. Unless your team is based in Miami (Go Dolphins!) or Arizona (Bear down Wildcats! 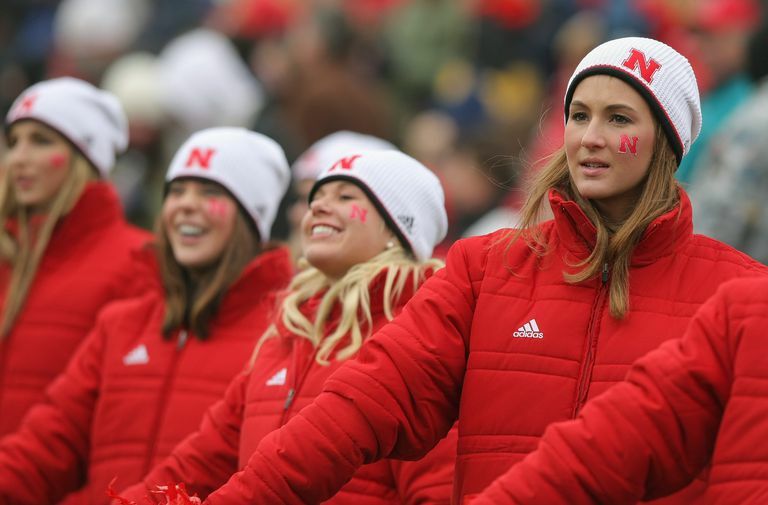 ), chances are high that most of your football season takes place during a rather chilly time of the year. Bundling up for the big game is a necessity if you're going to be tailgating with the best of 'em — as is being comfortable. For college games, we love the cozy, vintage-inspired stadium sweaters from Hillflint. Not every school is represented, but a huge number is. Layer up with a plaid scarf and some distressed jeans, and be ready to go all day in a pair of classic kicks, like Converse All Star hi tops. Get the Look: Hillflint stadium sweater, Old Navy bag, Converse sneakers, Old Navy scarf, Old Navy jeans. We know that it's currently a long way off, but there's no reason not to get your Super Bowl look squared away now — at least everything except the jersey! This is also an outfit that works for anytime your friends invite you over to crash on the couch to watch Sunday's big game, by the way. Boyfriend jeans will give you a little room to indulge in some snacks, and these dangling tassel earrings from Baublebar come in enough fun colors (as well as black and white!) that they can be matched to just about any team. Get the Look: Superga 'Cotu' sneakers, Baublebar tassel earrings, Uniqlo jacket, Hudson jeans, NY Giants jersey. When you're heading out to the bar for a college game, it's best to be ready for anything and just a little bit dressed to impress — especially since collegiate games are usually on Saturday. We love the pairing of another vintage-inspired Hillflint sweater layered with a faux fur stole and some vintage Levi's jeans from Re/Done that have been re-designed for a fresh fit. A bucket bag can hold all your essentials and loafers make a nice upgrade from sneakers (in case you end up at dinner or post-game cocktails). And just like that, you're suddenly the most stylish sports fan in town! Get the Look: Hillflint stadium sweater, Re/Done jeans, faux fur stole, Mansur Gavriel bucket bag, Everlane loafers. These days it seems like there might be an NFL game on almost every day of the week, but the biggest moments typically happen on Sunday afternoons and Monday nights. For that reason, we have a more casual approach to game day dressing when you're headed to the local NFL bar. Start with your favorite jeans and a fall-festive flannel that echoes the colors of your team (here, the blue and green are for the Seattle Seahawks!). Layer up a little with a cozy half-zip fleece and a team beanie. Sneakers (but NOT running shoes) are a good finishing touch for a laid-back "I could sit here all day" outfit. Get the Look: Seahawks half-zip sherpa jacket, Seahawks beanie, Re/Done jeans, J.Crew flannel, Nike sneakers.